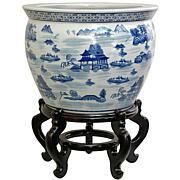 Make a stunning statement in your foyer with this fancy fishbowl. 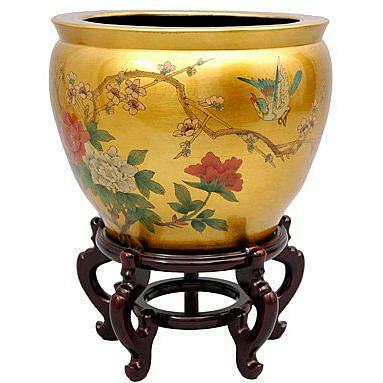 It's covered in a shiny gold leaf lacquer with hand-painted birds and flowers design. 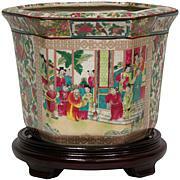 The inside is equally ornate, finished in a matte black lacquer with green and pink floral design. Impress your guests as soon as they enter your home. 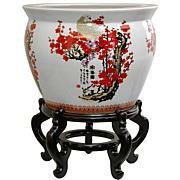 Stand is not included, but can be purchased separately. Select the 10-1/2" size to fit this fishbowl. 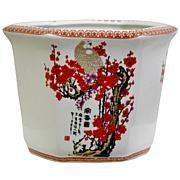 Bloem 8-Gallon Terra Pot Poly Resin Plastic Planter - 17-1/4"